It's shades of 'Slow Joe' from Paul Cleave's internationally best-selling Christchurch-set thrillers, or television's Dexter, with a feminine twist, as a killer takes the central role in a debut crime novel from US-based New Zealand author Leonie Mateer. Mateer was born and raised in New Zealand, but moved to the United States in her 30s to pursue business opportunities. She lived back in New Zealand for several years in the 2000s, running a luxury lodge in Northland, and now splits her time between Northland and the US. Audrey is a psychopath, a serial killer and a friendly resident in a small town in rural Northland, New Zealand. Audrey owns and operates The Three Suites perched high on a rural mountain top in Northland, New Zealand. Her many years of unsuccessful relationships have taken their toll on Audrey both physically and mentally. Now it is her time to get back at all the men who have done her wrong. 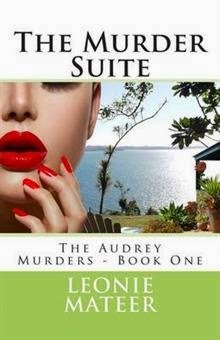 The Murder Suite is the first book in the series The Audrey Murders. New Zealanders can source the book from Wheelers Books here, and global readers from Amazon here (it's also available on Kindle). The second book in the Audrey series, CABIN BY THE SEA, has also been published, with a third instalment still to come.